Exactly one week ago, on Wednesday, January 17th, five members of the re:3D team joined the screaming throngs filling the theater at Madison Square Garden and watched as our CEO and Co-Founder Samantha Snabes took the stage. Everyone knew the judges’ deliberation was going to be hard: they were faced with picking just one winner from a golden lineup. When they came back to the stage, they had news for us. There would be a change of plans. Instead of a single one million dollar grand prize winner, each finalist company would walk away with a chunk of money, and they would award two million dollar checks. Samantha sat in a room just offstage with the other representatives from the finalist companies, each wearing noise-cancelling headphones and oblivious to the twist of events that was taking place onstage. The camera on the big screens cut to them, giving the audience a glimpse of the eight. If I’m not mistaken, all of them were on their phones. In ones, twos, and threes, they were plucked from the room and whisked onto stage. First, Manal Kahi from Eat Offbeat and Becca Keaty of Bunker Labs, each winners of $180,000. Next came Elizabeth Lindsey of Byte Back, who took home $360,000. As each round passed, those of us in the audience knew our odds of taking home a million increased. Then came the $500,000 round – three of them – Sebastian Jünemann of CADUS, Naveed Parvez from Andiamo, and Or Retzkin of EyeControl. That was it. Samantha didn’t know it yet, but we’d just won a million dollars. 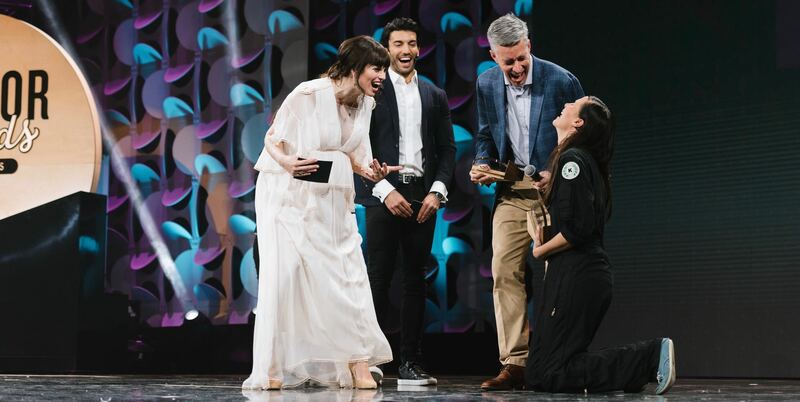 The final two – J. Kevin White of Global Vision 2020 and Samantha – faced the hosts on stage with expressions that vacillated between fear and confusion. Almost before the words had escaped co-host Adi Neumann’s mouth, Samantha grabbed White’s arm with the realization they’d each be taking home a million. Confetti exploded from the ceiling, friends and family rushed the stage, and the audience went wild. We did, at least. 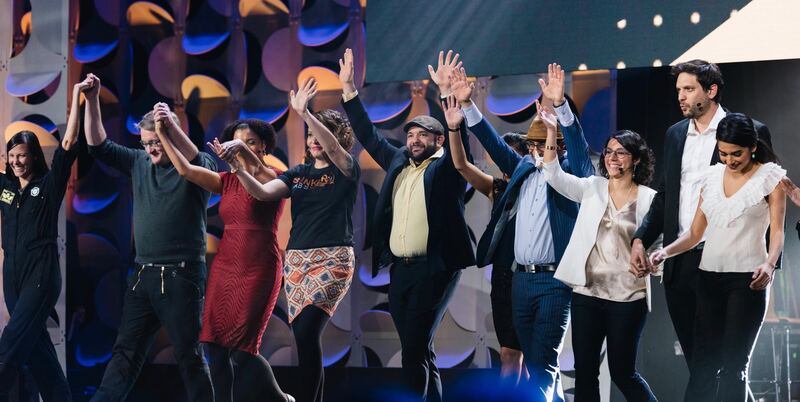 We said it last week – this entire experience with WeWork has been absolutely incredible, and taking home a grand prize was just the cherry on top. 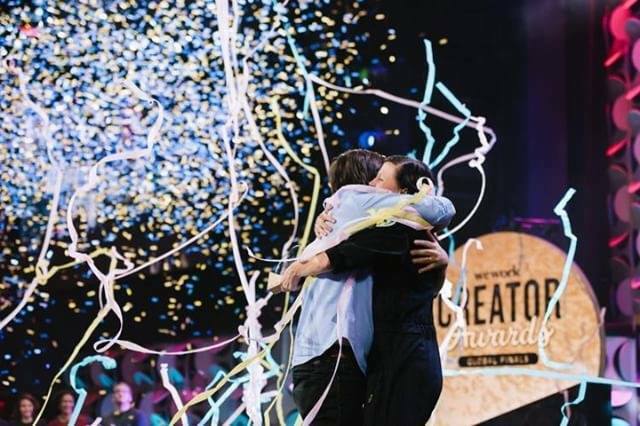 We’ve learned a lot since taking the Creator Awards stage in Austin last June, we’ve met a lot of amazing people along the way, and we continue to be inspired by our fellow finalists and semifinalists and the good you are doing around the globe with your work. Postscript: We have a lot of people to thank. First and foremost, thank you WeWork for making this incredible event happen. Your vision is inspiring and the lineup of companies in the Global Finals exemplified that. We will forever be grateful for this opportunity and experience. Thank you to all the people and organizations who have supported us along the way and made our journey to last night’s stage possible: Kickstarter, Startup Chile, Unreasonable Institute, Bridge Community, Parallel18, Bunker Labs, Tom Chi, Pascal Finette, Wevolver, IEEE N3XT, and more. Gracias a Sebastian Vidal, Executive Director of Parallel18, for speaking on-stage at the finals as our advocate, or testimonial. From Santiago Startup Chile days to Puerto Rico with Parallel18, you’ve been with us since the beginning. Thank you to all our fellow Creator Award Global Finalists and Semi-Finalists. Eat Offbeat, Andiamo, Bunker Labs, Byte Back, CADUS, EyeControl, Global Vision 2020, Quaker City Coffee Company, Warmilu, Coral Vita, Chatterbox, and LeVar Burton Kids. You guys inspire us. And lastly, thank YOU, our community! From our very first Kickstarter backers to those of you who have been following our story online, we couldn’t do it without your support. We are so excited to update you on our plastic-trash-printing progress.